This is a busy day here are NRP. First is the news that Tom Easton’s wonderful sf novel, The Great Flying Saucer Conspiracy, is now available. As with all our books, it is under $5 AND is DRM free. It is currently available through our web store and will soon be available through Amazon, B&N and other online e-tailers. Our second bit of news today is the announcement that some of our titles can now be found at Coffee Time Romance as well. Now, don’t let the title throw you. CTR is a wonderful site and you can find just about any sort of book through their web store. We’re very pleased to be associated with the wonderful folks there. You can find our CTR store here. Monday afternoon Gabe had had the anthro hall in the other wing of the building. Two hundred padded seats, burgundy plush and polished plywood, rising like a wave before him. Perhaps a fifth of them were occupied, though not always by attentive students. There were three couples that seemed to have their minds on something else entirely, and several bent heads, closed eyes. Well, as long as they didn’t snore. He was talking to the others, anyway, clicking through slides and bulleted lists, using his mouse-wand to point and highlight. “There’s never been much doubt that humans were special. We’re a conceited gang, but it’s clear that there are significant differences between us and the rest of the animal world. “What are those differences? Language? But many animals communicate with sound. Vervet monkeys even have different alarm calls for different threats–eagle, snake, leopard. Sound and meaning, definite communication.” Click-click-click, vervets watching ground and sky, fleeing high or low. They’d read about this in their text. If they’d done their assignment. “Apes use varied calls and gestures, and chimps and gorillas can learn Ameslan, American Sign Language.” Click-click, Washoe asking for a drink, Koko trying to teach her kitten Sign. “Tool use? Again, chimps make and use simple tools.” Click, a chimp with the famous termite-fishing twig. Click, another bashing nuts with a stone. “Intelligence?” Click, a porpoise. Despite concern, despite a worldwide ban on whaling, the big whales were no more and the small ones survived only in Marinelands. People had left too few fish and plankton in the seas to support them in the wild. “Some think we may be outclassed on that.” A few quiet laughs rippled through the hall. A hand went up, a smile, almost a smirk. He could guess why. “Yes, Mr. Clancy?” A serious-looking fellow. Short hair, no beard or mustache, not wearing a suit but easy to imagine in one. Give him a few more years. Maybe a Saucerite mask, too. Would he be one of the few who believed his abductors had planted a mental eavesdropping device in his brain? He turned his grin on the rest of the class and noticed for the first time the bulky figure in the shadows of the back row. A Placoderm, humanoid like most of the aliens but so massive and solid that it looked like it belonged on the wrestling circuit. Its blocky head jutted from a colorful, tent-like dashiki. It hadn’t been there the class before; indeed, even though the aliens were famous for auditing a wide variety of courses, he had never had one sit in on one of his. The students were ignoring it, just as they would have on the street, where the sheer quantity of imitation aliens, the Saucerites, diluted the impact of the few genuine aliens. “You see?” he said. “We can’t help ourselves, can we? Show us something, and we have to improve on it. At least change it. Make it more complicated, even quite rococo. A tool like this, a story, a religion, a language. We never stop, and that’s something new. Gabe hesitated before musing aloud, “Human only?” He eyed the Placoderm in the back row thoughtfully. Would it take offense at being brought into the discussion? For all the peaceful intentions the alien species had loudly declared when they had appeared a few years before, they were surely quite capable of showing their displeasure. Their embassies could not be broken into by stealth or force. Why would the aliens be so good at defense if they had never had anyone to defend against? And these would be the winners, the ones who had prevailed against the defenses of others. Or their descendants. Evolution in action for societies and technologies. The next step was in the syllabus. So don’t worry about it, he told himself. “There are profound differences between humans and our alien visitors.” Several heads twitched to peek at the back of the hall. Click-click, click-click, click-click, a Placoderm, an Ent, a Spider, a Burd, a Furry, a Helf. “Major differences,” Gabe repeated. Similarities too, of course. It had actually shocked some biologists to see them eat our food. Earthly proteins have a left-hand twist, sugars and starches a right-hand twist, all due to a flip of the coin at the dawn of life, and lefties cannot digest righties, and vice versa. Surely the coins must flip the other way on other worlds, and we should–sometimes, anyway–be toxic to each other, or at least non-nutritious. Other biologists, who had insisted that biochemistry was just the way the parts went together, were delighted. So were chefs, who very quickly noticed that some of the aliens tended to think of human dishes–even those heavy on chili peppers and wasabi–as rather bland. Unfortunately, the aliens would not provide samples of their own herbs and spices. Anatomy had raised similarly mixed feelings. The aliens were all roughly humanoid, with heads and arms and legs and hands, and their voices worked in the human range. Some had wished for slugs and insects, telepaths and color flashers. Others had said, hey, it works, and besides the really weird aliens probably didn’t want to look at us anyway. “They evolved from different stock,” he went on. “They had to suit different environments. For instance, we think the Helfs come from a high-gravity world. Their broad base offers exceptional stability, which must be to protect the more fragile upper portion. “The Furries–the chitinous caps may reflect a shelled ancestor, something like a crab, just as the pen of a cuttlefish is the vestigial remnant of a mollusk’s shell. The fur does not suggest an aquatic ancestry, but there are Earthly crabs that live on land. He noticed a few skeptical looks, but he went on anyway. “Do Helfs think of intelligence–that delicate upper body, head and brain–as in some sense a passenger on the solid, animal base? That might affect attitudes toward the natural world, and such a species might never face the sort of environmental crises we have had to deal with. A hand: “Mr. Gortley?” A chubby fellow, hairline already receding. More nods, yes, this was what they had heard all their lives from Sunday supplements and tabloid feeds, TV and film, even in novels. Not, he hoped, in school. And the flourishing of Saucerites that had followed the aliens’ arrival had only strengthened the tide of rumor. Someone laughed. Several more joined in as they got the joke. Gortley flushed. Gabe grinned at the class, and especially at Ms. Worth. Yes, the reproduction of the tomb paintings showing how the pyramids were assembled. Time was what it had taken, time and the effort of ten thousand strong backs and pairs of hands, not the machines of alien construction crews who could erect an impregnable Embassy almost overnight. Not to mention all the trial and error, visible in the oldest pyramids of all, half-finished and collapsed, that it had taken the Pharaohs’ architects to get it right. He glanced at the back row, but the Plac was no longer there. He wished he had noticed when it rose and sidled between the seats toward the door. Perhaps it had just been beating the rush, the mob of students gathering their books and bags. Those with another class or a work assignment next period moved faster, even sprinting toward the exit. The rest seemed quite content to clot the aisles, drift toward the door, pausing, moving, always chattering. As far as Gabe could tell, not a word of the chatter dealt with his lecture. He had no idea why the Plac had shown up for this class and none of those before, or what it had hoped to learn, although his syllabus was posted on the Net. It could have seen what he planned to talk about today, could have thought it might be interesting. Or amusing, more likely, a provincial ape pretending that it shared its essential apeness with the gods themselves. Was it lesé majesté to do so? Perhaps, but he could hardly refrain, ape that he was. . . . 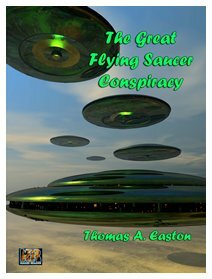 The Great Flying Saucer Conspiracy by Thomas A. Easton is now available at the NRP website. Look for it in coming days at Amazon.com and B&N.com and other e-book retailers. Today’s post is by Tom Easton, author of The Great Flying Saucer Conspiracy (April 2011) and Firefight (August 2011). The Great Flying Saucer Conspiracy began as a back-of-the-envelope calculation in the middle of an evening anthropology class. I was trying to tell my students that our forebears were not as dumb as people often make them out to be. Go back a couple of million years and, sure, they had small brains and brow ridges and looked like the second cousins to chimps that they were. But nobody was setting them any examples when it came to inventing new technologies. Whatever they came up with, they came up with entirely on their own. And there weren’t very many of them to do it. At any rate, that night I suddenly paused, thought for a moment, and said, “Y’know…” I then turned to the board and started making a list of great ideas–ideas without predecessors, ideas that later folks could modify into thousands of important inventions. Chipping stone was one. So was the wheel, fermentation (bread, beer, penicillin…), and so on. The list quickly grew to about 50 items. I then added rough estimates for the dates of these inventions, and then of the approximate world population at those dates. After a bit of arithmetic, I turned back to the class with an awed tone in my voice. It appeared that for the last 2.5 million years, we had been coming up with great ideas at a roughly constant rate: one idea per million people per 20,000 years. Later I refined the list, the dates, and the population estimates. The constant changed a bit–instead of “every 20,000 years,” I had to say “every 20-100,000 years”–but it was still pretty steady. I also noticed the rather surprising feature that over the last 130 years, the rate of great-idea innovation had declined. The, without saying much about that apparent decline, I turned it all into an article for the online science fiction magazine, Tomorrowsf (January-February 1998 issue), and moved on. You can read the article at http://www.sff.net/people/teaston/front7.htp . A little while later, I began to think about the way the rate of great-idea innovation had dropped off. I began to wonder why such a thing should happen, and I came up with a the kind of possible answer it’s really hard to take seriously. Certainly if I had tried to make a magazine article out of it, it would have branded me forever as a crackpot. But as fiction, it could work. Want to know what my answer was? You can wait and read the novel, or you can make your own guesses. Post them here, and we’ll blow fanfares for the best ones.